mAh per display square in. 257mAh/sqrin. This octa-core smartphone is among the earliest smartphones to feature an in-display fingerprint sensor in lieu of a rear- or edge-mounted scanner, and it blusters with a Leica Triple Camera that's made up of a high-resolution 40-megapixel main cam, a 16-megapixel ultra-wide-angle cam, and an 8-megapixel telephoto cam. To wrap it up, it runs on an AI-ready Kirin 980 7nm eight-core processor coupled with a massive 8GB RAM count. 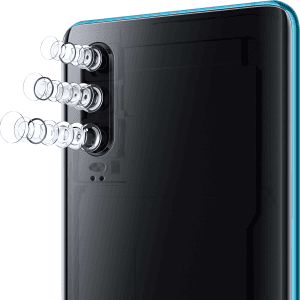 On-paper Pros & Cons The Huawei P30 could have done better than a 6.1-inch 1080p-only screen, but its Leica Triple Camera and 32-megapixel selfie cam nevertheless make it a solid high-end option. We explore the remainder of its pros and cons in this specs-driven assessment. 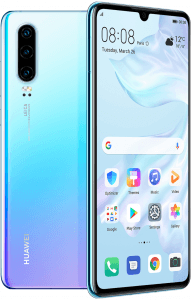 (more) Huawei phones 2019 View all the most recent and upcoming Huawei phones.